The guard is cut from one thin sheet of plastic, which is very lightweight and flexible. It takes its shape when attached to your forks, so always fits perfectly. 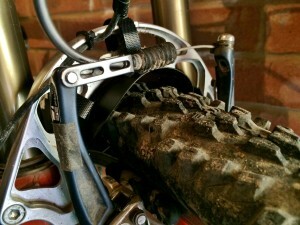 Being a fork mounted guard, it is also shorter than say a Crud Catcher, as the guard turns with your wheel. Fitting is pretty simple, although don’t try and be lazy like I was – take the wheel off first and you’ll preserve some sanity and your fingers! Basically you just tie on the guard using the Velcro tape provided. There was plenty for me, including a discarded piece I incorrectly measured. By using the velcro, the guard is removable, although at 22g it’s so light and small I’d just leave it on. You can also use zip ties (but you’ll have to source your own) for a more permanent fixing. I’ll admit I was worried about clearance on my bike. 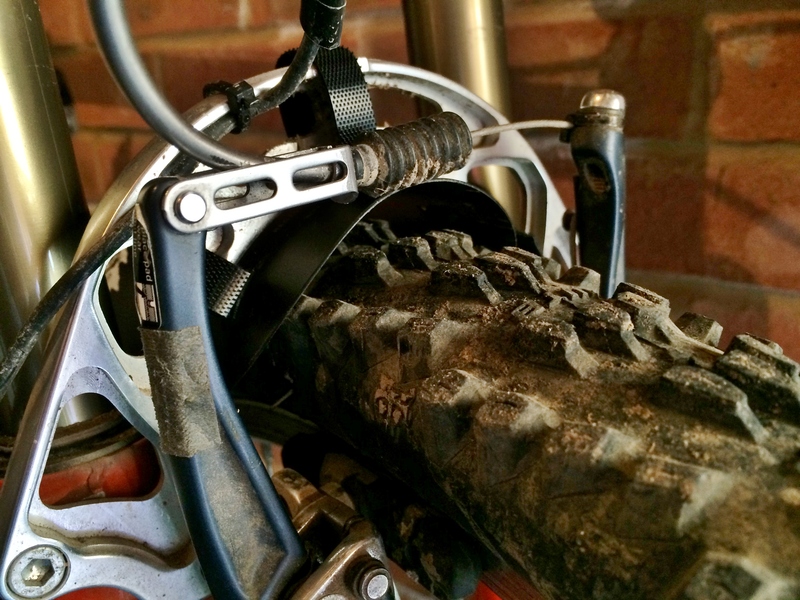 I run a 2.3″ tyre, and my bike, being an antique by modern standards, still has V-brakes. As you can see in the photo below, it looks a bit tight, but I had no problems in use. On my test ride I had no problems with clogging, although I encountered patches of thick gloop, rather than sustained mud. The guard did a fine job of stopping grit and mud pinging up and hitting me, and most importantly, my face, which is exactly what I wanted. Personally, I use mudguards as a safety feature to protect my eyes and the Bender Fender certainly did the trick. Although the guard is quite small, nothing got through and it made my old Crud Catcher suddenly feel excessive and heavy. 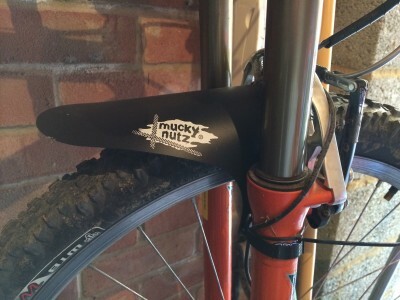 So, whilst a mudguard is never going to be the most exciting thing in the world, this one is very good. Effective, light weight and at £8.99 well priced – great product. Available direct from MuckyNutz website.